We look at a paper that appeared in the Journal of the American Medical Association and explore how to use R to confirm the results. It is assumed that you are familiar will all of the commands discussed throughout this tutorial. The authors examine the trends of several studies of cholesterol levels of Americans. The studies have been conducted in 1960-1962, 1988-1994, 1976-1980, 1988-1994, and 1999-2002. Studies of the studies previous to 1999 have indicated that overall cholesterol levels are declining. The authors of this paper focus on the changes between the two latest studies, 1988-1994 and 1999-2002. They concluded that between certain populations cholesterol levels have decreased over this time. The increase in the proportion of adults using lipid-lowering medication, particularly in older age groups, likely contributed to the decreases in total and LDL cholesterol levels observed. Here we focus on the confirming the results listed in Tables 3 and 4 of the paper. We confirm the p-values given in the paper and then calculate the power of the test to detect a prescribed difference in cholesterol levels. Links to the tables in the paper are given below. Links are given to verbatim copies of the tables. For each table there are two links. The first is to a text file displaying the table. The second is to a csv file to be loaded into R. It is assumed that you have downloaded each of the csv files and made them available. The first thing we do is confirm the p-values. The paper does not explicitly state the hypothesis test, but they use a two-sided test as we shall soon see. We will explicitly define the hypothesis test that the authors are using but first need to define some terms. We need the means for the 1988-1994 and the 1999-2002 studies and will denote them M88 and M99 respectively. We also need the standard errors and will denote them SE88 and SE99 respectively. Note that the standard errors are given in the data, and we do not have to use the number of observations to calculate the standard error. However, we do need the number of observations in calculating the p-value. The authors used a t test. There are complicated formulas used to calculate the degrees of freedom for the comparison of two means, but here we will simply find the minimum of the set of observations and subtract one. We first need to read in the data from table3.csv and will call the new variable t3. Note that we use a new option, row.names=”group”. This option tells R to use the entries in the “group” column as the row names. Once the table has been read we will need to make use of the means in the 1988-1994 study (t3$M.88) and the sample means in the 1999-2002 study (t3$M.99). We will also have to make use of the corresponding standard errors (t3$SE.88 and t3$SE.99) and the number of observations (t3$N.88 and t3$N.99). "all"    "g20"    "men"    "mg20"   "m20-29" "m30-39" "m40-49" "m50-59"
 "m60-74" "m75"    "women"  "wg20"   "w20-29" "w30-39" "w40-49" "w50-59"
 "N.60"  "M.60"  "SE.60" "N.71"  "M.71"  "SE.71" "N.76"  "M.76"  "SE.76"
 "N.88"  "M.88"  "SE.88" "N.99"  "M.99"  "SE.99" "p"
We can now calculate the t statistic. From the null hypothesis, the assumed mean of the difference is zero. We can then use the pt command to get the p-values. We can now compare this to Table 3 and see that we have good agreement. The differences come from a round off errors from using the truncated data in the article as well as using a different method to calculate the degrees of freedom. Note that for p-values close to zero the percent errors are very large. It is interesting to note that among the categories (rows) given in the table, only a small number of the differences have a p-value small enough to reject the null hypothesis at the 95% level. The differences with a p-value less than 5% are the group of all people, men from 60 to 74, men greater than 74, women from 20-74, all women, and women from the age groups of 30-39, 50-59, 60-74, and greater than 74. The p-values for nine out of the eighteen categories are low enough to allow us to reject the associated null hypothesis. One of those categories is for all people in the study, but very few of the male categories have significant differences at the 95% level. The majority of the differences are in the female categories especially the older age brackets. "S88N"  "S88M"  "S88SE" "S99N"  "S99M"  "S99SE" "p"
Again, the p-values are close to those given in Table 4. The numbers are off due to truncation errors from the true data as well as a simplified calculation of the degrees of freedom. As in the previous section the p-values that are close to zero have the greatest percent errors. Now that the cutoff t-scores for the 95% confidence interval have been established we want to find the probability of making a type II error. We find the probability of making a type II error if the difference is a positive 4. We see that the composite groups, groups made up of larger age groups, have much higher powers than the age stratified groups. It also appears that the groups composed of women seem to have higher powers as well. We now look at the differences in the rows of LDL cholesterol in Table 2. Table 2 lists the cholesterol levels broken down by race. Here the p-values are calculated for the means for the totals rather than for every entry in the table. We will use the same two-sided hypothesis test as above, the null hypothesis is that there is no difference between the means. We cannot reject the null hypothesis at the 95% level for any of the differences. We cannot say that there is a significant difference between any of the groups in this comparison. 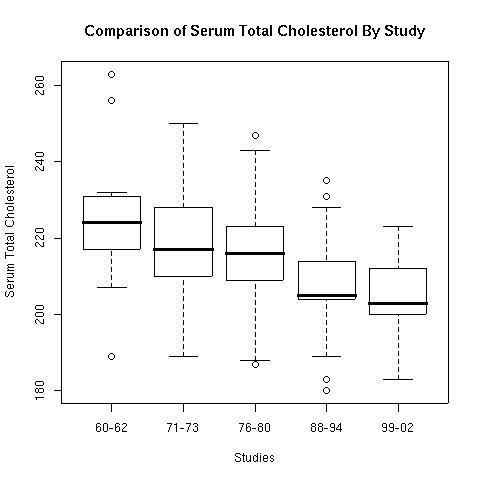 We examined some of the results stated in the paper Trends in Serum Lipids and Lipoproteins of Adults, 1960-2002 and confirmed the stated p-values for Tables 3 and 4. We also found the p-values for differences by some of the race categories in Table 2. When checking the p-values for Table 3 we found that nine of the eighteen differences are significant. When looking at the boxplot (below) for the means from Table 3 we see that two of those (the means for the two oldest categories for women) are outliers. Boxplot of the results in table 3. The boxplot helps demonstrate what was found in the comparisons of the previous studies. There has been long term declines in cholesterol levels over the whole term of these studies. The new wrinkle in this study is the association of the use of statins to reduce blood serum cholesterol levels. The results given in Table 6 show that every category of people has shown a significant increase in the use of statins. One question for discussion is whether or not the association demonstrates strong enough evidence to claim a causative link between the two. The news articles that were published in response to the article imply causation between the use of statins and lower cholesterol levels. However, the study only demonstrates a positive association, and the decline in cholesterol levels may be a long term phenomena with interactions between a wide range of factors.